We attended a Chinese New Year Celebration earlier in the month. My daughter enjoyed making a Spring Couplet. Both kids also really enjoyed watching the Lion Dance. That is great! 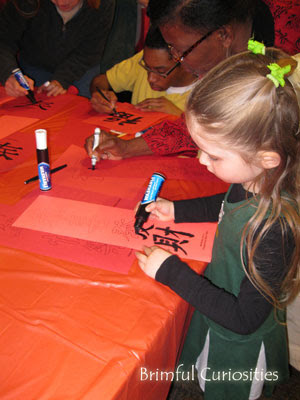 Fun and gives kids a chance to get to know other cultures. I love this idea and exposing kids to a variety of cultures. Thanks for the comment on my blog. I look forward to following and connecting via blogs. That looks like fun! I love things that are a little different. How interesting that must have been. I wouldn't mind attending myself. It looks like this was a great experience!